Mopar Club Connection Help And F.A.Q. Answers to frequently asked questions about The Mopar Club Connection. What is the Mopar Club Connection? – The Mopar Club Connection was built to promote Mopar Clubs and Organizations. The connection provides resources and information about Chrysler, Dodge, Plymouth, Jeep and Mopar vehicle Clubs & Organizations around the world . Cruising the connection is a great way to locate Mopar Clubs that have internet sites. The types of sites in our database include Mopar related clubs, registries, organizations and more. How Do I Contact The Mopar Club Connection? – To contact us concerning a feature, member or if you are having a problem viewing our site, use our feedback form Located Here. How Do I Join The Mopar Club Connection? 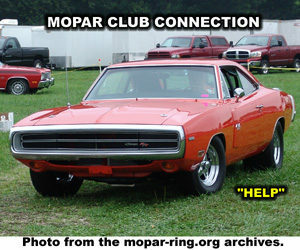 – Joining the ring is totally free and is a great way to get more people to visit your Mopar Club or Organization site. To get your Mopar Club or Organization listed you will need to submit a membership application and then add the Mopar Club Connection Member link to your page/site. How Do I Add The Required Mopar Club Connection Member Link To My Page/Site? – All members are required to have a reciprocal link back to the Mopar Club Connection. This can be a standard text or graphic link back to the Mopar Club Connection. For more information on adding the required link visit the Mopar Club Connection Member link section. How Do I Update My Member Site/Page Listing? – To update your Mopar Club Connection Member information you can visit here. Update links are also provided at the bottom of every connection page.